YouTube: "Produced by Hit 'n' Run [for Dutch television], this interview took place with Paul B. Davis from the BEIGE collective at the 35th International Film Festival Rotterdam. Paul exhibited a piece at the exhibition 'Satellite of Love' produced by Exploding Television. 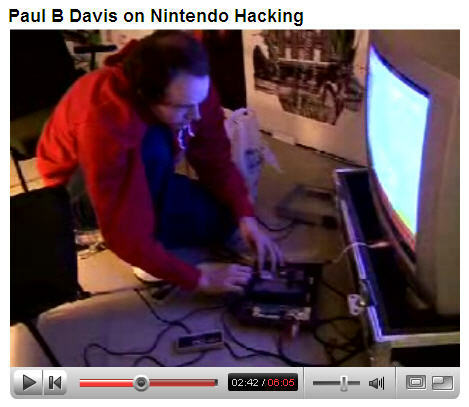 Here he talks about his Nintendo Cartridge Hacking." No, if the movie has a secret heart, it's why Arcangel and Davis, who used the phrase "8 Bit" in an LP title five years ago and are sort of the poster children for the current scene, started hacking Nintendo cartridges in the first place. Davis was always the more political of the pair in how he speaks about it, but he makes an interesting point in this YouTube vid: that untapped aesthetic potential exists in everyday gear that is meant to be inaccessible to us. As he describes it, the "cheapest, highest quality audio and video generation system you could get" is locked up in a proprietary system that mostly sits in your closet. Although its hardware and software constitute a complete or "general purpose" computer, it only does one thing, which is play this one particular brand of game. Bereft of a veneer, interaction with such complicated machinery requires a significant amount of technological knowledge and awareness. In this spirit, "Fat Bits" represents a step towards what Cory and I describe as "Post-Data". We create computer art which is aesthetically aware of both its own identity and the underlying process which supports it - that is to say it recognizes the fundamental prototype of the "computer", and not the "software", as the tool and medium. The content for "Fat Bits", video of a NHL hockey fight, was chosen because the close-up nature of its imagery makes for convenient replication on low-resolution systems such as the Nintendo Entertainment System. The use of the Nintendo Entertainment System is itself important because it, firstly, signifies an artistic "re-licensing" of proprietary corporate technology and, secondly, refutes Nintendo's forced obsolescence profit structure which defines it as "outdated" (the Nintendo Entertainment System was introduced to the US home video game market in 1986). Our primary foundation of Post Data is then this: the conscious corruption of data, the releasing of bits from their imprisonment within the restrictive, limiting boundaries of corporate software applications, and the exploitation of the extreme complexity of computer systems paired with the extreme intentionality of artist(s) who seek to engage the computing process at a fundamental level.